The Insatiable Critic: July Fourth special: Super 8 is really great, let's make a date watch Super 8! July Fourth special: Super 8 is really great, let's make a date watch Super 8! 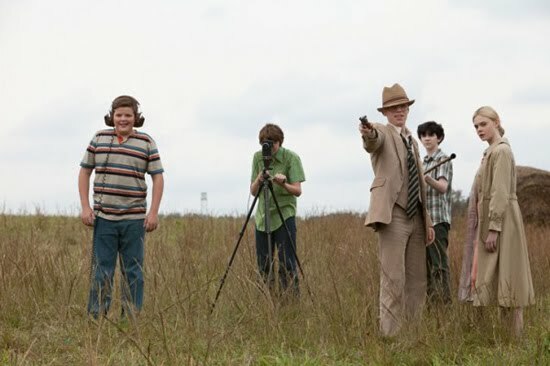 No movie this year has surprised and delighted me as much as Super 8 did; which I managed to see this weekend quite by chance. It's been one of the most rewarding viewing experiences I've stumbled upon lately. I chose this movie to review on Fourth of July partly because I just can't contain my enthusiasm for seeing a film THIS good, but mostly because I can't think of anything more American than a plot that revolves around a bunch of precocious kids in 1979 Dayton, Ohio, running around making movies. It's a good old-fashioned, growing up geeky in America mixed with a good dose of action/thriller supernatural good times. The brain child of Steven Spielberg and J.J. Abrams, the two directors use this film to wax nostalgic about their mutual passion for film-making from a young age. Indeed, young Spielberg was born and raised in Cincinnati, Ohio and started his film career running around with, you guessed it, an 8 mm. The film has a kind of movie magic, a kind of wonder, that I have seldom seen since the great adolescent/coming of age films of my youth - The Goonies, E.T., Flight of the Navigator and Summer of 42 all come to mind. Indeed, the Amblin Entertainment logo featuring the iconic scene from E.T. of the bike flying against the moon is the first thing the audience sees, already stirring up the nostalgic cockles of the audiences' hearts. The biggest complaint I have about the film really only involves the massive amount of suspension of belief the first dramatic scene asks of the audience. You'll see what I mean. But as things get increasingly weirder and weirder; the quality level just goes up and up. A big part of it is that the kids, who are trying to film a zombie movie in the midst of a real supernatural occurrence going on in their town, are all great actors. Many of them are newcomers - according to Entertainment Weekly, Joel Courtney, who plays the main character Joe Lamb, went to Los Angeles last summer to visit his brother without a single acting credit. "I really wanted a commercial and $100, and I got Super 8," the article says. Elle Fanning, who plays Joe's love interest Alice Dainard, is probably the most well-known out of the bunch for being the kid sister of Dakota Fanning. Riley Griffiths, who plays the obsessive director Charles, definitely comes across as kid Spielberg personified. Add in a stoner friend with a car and a kid with a penchant for explosives and flames, and you're in for one wild, fun ride. I won't get into the plot. I think its important to watch the story unfold on the screen without knowing much about it. I will say this - there are some scary moments, one that actually made me jump back against my seat, but just as things are on the verge of getting a little too tense, the directors toss you a lifeline of levity with great writing that shows no matter how crazy their current situation might be, kids will still be kids. What most impressed me about Super 8 is the writing of the script shows kids being intelligent; not stereotyped cardboard cutouts that many high school films portray them to be. It's not about the jocks vs. the nerds, or who's better than who. You never even see the kids at school because its summer and the directors wisely chose that as the perfect time A. to release the movie and B. set the movie because it allowed them to focus solely on this small group of adolescents that are just doing their damndest to follow their hearts and their passions. And best of all, the message brought home at the end is that there's a whole lot adults can learn from kids as well, if they would only listen. So seriously, what are you still doing here reading this? Go forth and Super 8! I used to go the my friends house and watch Flight of the Navigator over and over again and I swear it's stood up well, I still think it's a good movie as an adult.